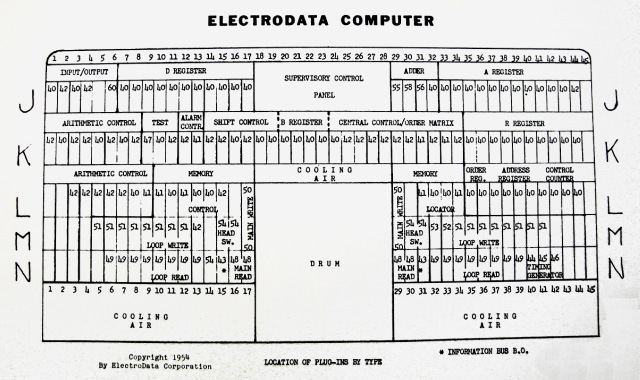 John Alrich, the engineer who implemented the Datatron control unit, described the machine in considerable detail in an article in the March, 1955 Transactions of the I.R.E. Professional Group on Electronic Computers. 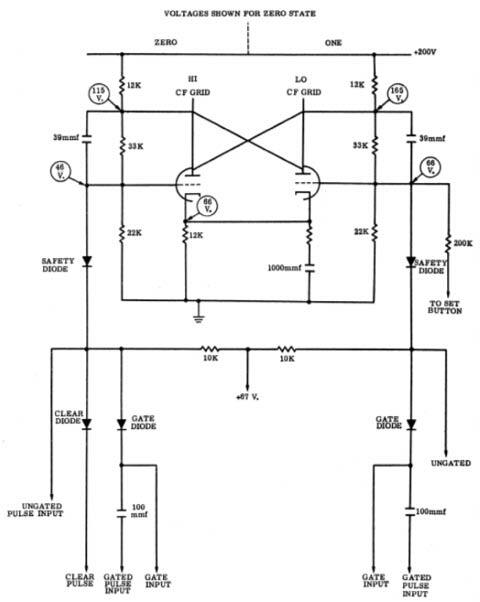 He stated that there were 173 circuit packages in the Datatron of twenty-three standard types. Fifty-eight percent of the packages were of two types: the Flip-Flop package, and the Blocking Oscillator package. 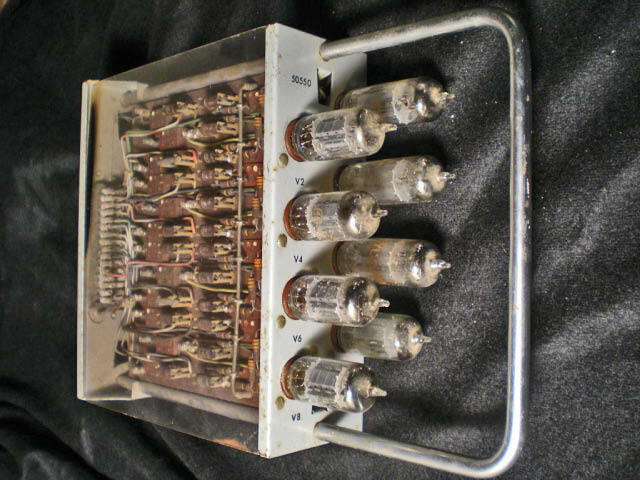 Each of these packages contained eight dual-triode vacuum tubes. 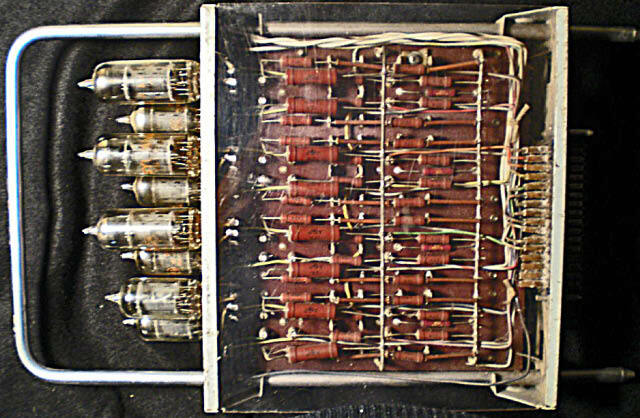 The Flip-Flop package held four dual triodes forming the actual flip-flops and four dual triodes configured as cathode followers. The cathode followers isolate the flip-flops and provide a low-impedance output. The Flip-Flop package formed one decimal digit of each register. 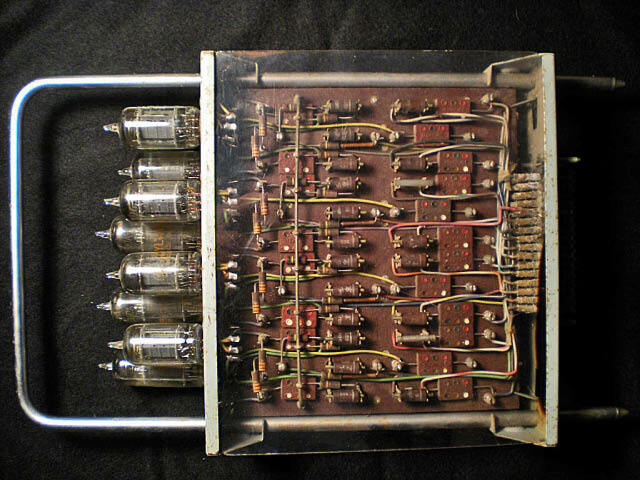 The Blocking Oscillator package also contained eight dual-triodes configured as four blocking oscillators with a cathode follower and "puller" tube in front of the actual B.O. Bob Kubic worked as a programmer at Babcock and Wilcox in Lynchburg Virginia. They had a Datatron that was used to design the Indian Point I nuclear power station, the nuclear merchant ship Savanna, The Liquid Fuel Reactor experiment, and various design studies that led to the next generation of reactors. 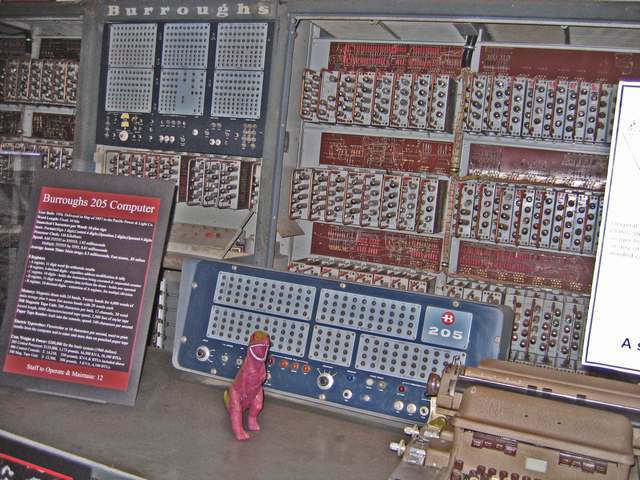 Bob still has one of the B-register decade packages from that machine. He shared these pictures of it. These two photos show the layout with most of the capacitors and diodes on one sided of the printed circuit card and most of the resistors on the other side. The resistors generated more than a little design headache and controversy. Note the large number of 1% precision resistors. 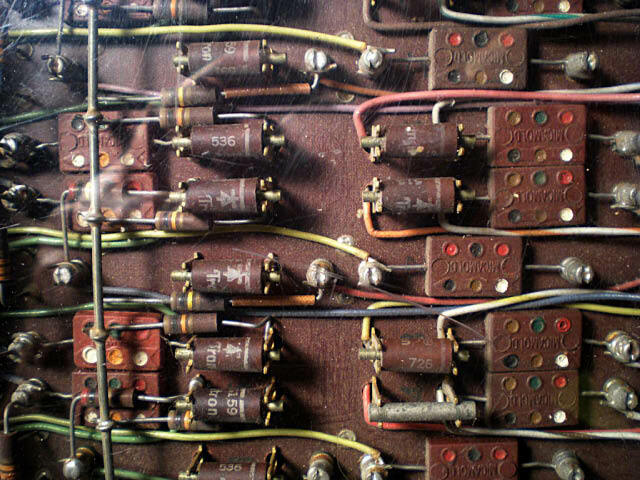 The added cost over using 5% resistors in the voltage divider area of the circuits was estimated at $600 per computer. The tradeoff, though, was greater tolerance to tube aging so the decision was made to go with the 1% resistors. Note the diode clips in this photo. These were also controversial. Both of the ElectroData consultants weighed in on the inadvisability of using clips versus soldering in the diodes. Harry Huskey was concerned that diode clips had not been reliable in his past experience. Since Huskey was already a veteran of at least four computer construction projects at this point in early 1952, his concerns were taken seriously. Ernst Selmer took the issue to Julian Bigelow at Princeton, chief engineer on the IAS computer. Bigelow thought these clips looked solid but he and Selmer were still concerned that they could lead to errors and recommended experimentation to identify the potential for trouble.